Bogs or boglands also called peatlands are weird and dramatic places. They may appear flat, wild and dull, but look closely, and you realise that they're full of unusual wildlife! There are plants that eat animals, amazing spiders, and even the ground itself wobbles beneath your feet if you jump up and down. Bogs are wetlands which are made up of 98% water and only 2% of solid matter. They grow in areas of waterlogged soils or basins. Bogs contain up to 10 metres depth of peat. Peat or turf is made up of the partly decayed remains of plants that once grew in the bog preserved for up to 10,000 years in the bog. Bogs receive their water and nutrients from rainfall. As a result they are habitats that are acidic and very poor in the nutrients needed for plant and animal growth. 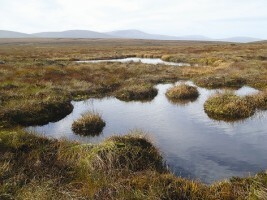 Three types of bog are found in Ireland - the raised bogs of the midlands, the large expanses of Atlantic blanket bog that cover the landscape of the west coast of Ireland, and the mountain blanket bogs that occur on high ground above 200 metres on mountain ranges throughout the country. Bogs consist of a variety of habitats for wildlife including low mounds or hummocks, damp hollows, small lakes, wooded areas, ridges, flushes, swallow holes, and flat expanses. 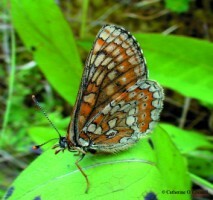 The variety of habitats is mirrored by a rich biodiversity of plants, animals and birds. 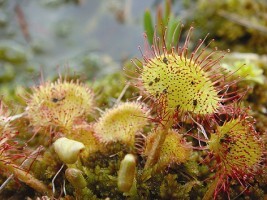 The flora of bogs includes some highly adapted plants such as the insect-eating sundew. This round-leaved sundew is an insect-eating plant found on boglands. The spoon-shaped leaves are covered in red tentacles each with a blob of sticky glue. An insect crawling on the leaf gets trapped in the glue and the tentacles move to trap it. The whole leaf closes over the insect which is then digested. Boglands have been exploited as a fossil fuel and as a soil-improver in gardens. The result is that bogland has become depleted and in danger of disappearing altogether. Attempts are being made to conserve a sample of bogland deemed worthy of preservation for its habitat value, for peoples' enjoyment, and for its role in education & scientific study. In our struggle to slow climate change, bogs are useful for storing carbon dioxide, one of the gases contributing to global warming when released into the air which happens when fossil fuels are burned. To learn more about bogs, check out Irish Peatland Conservation Council. Read IPCC's Peatlands 2020 Conservation Plan - Halting the Loss of Peatland Biodiversity. Click here for a list of Irish Wetland sites (Ramsar sites) some of which are bogs and fens.